July 4th parade set for 10 a.m. 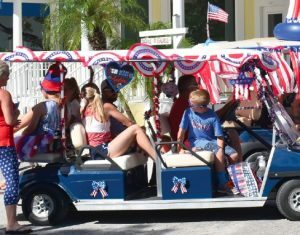 The 2018 4th of July Bike Parade that has made the island famous will be held at 10 a.m. on Wednesday, July 4. That means be at PJ’s Seagrille side parking area (between the Old Theatre Building and Englewood Bank & Trust) by at least 9:50 a.m. to get a primo spot in the procession. The parade winds through the historical district pretty much in a random fashion, with much hornblowing and general mayhem. Decorations are encouraged, but make sure they are secured tightly so there isn’t a lot of litter.